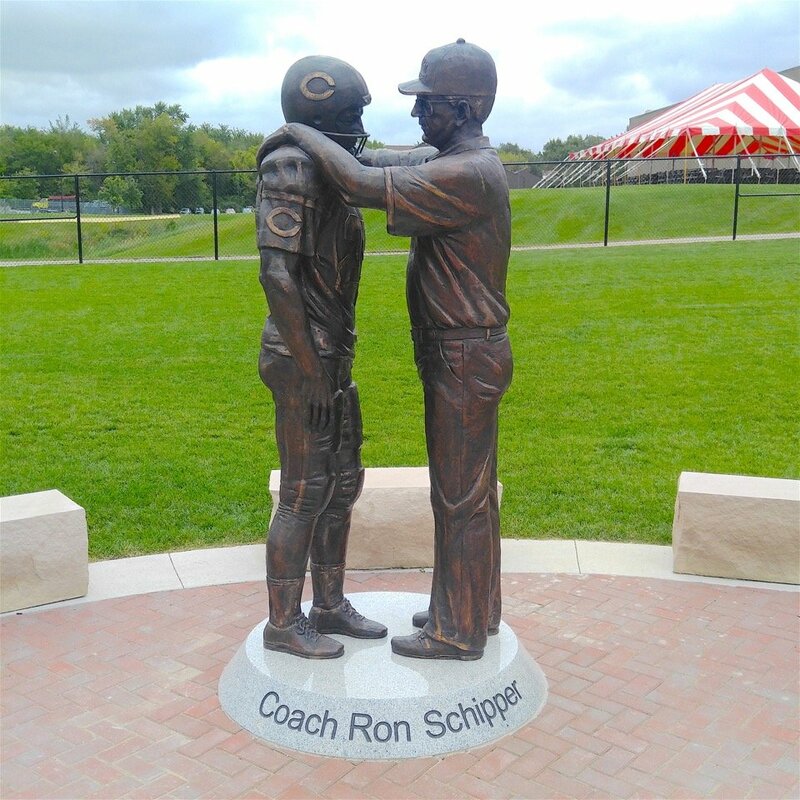 A bronze statue of legendary coach Ron Schipper was recently unveiled at Central College’s football stadium. Ron Schipper, Central College’s Hall of Fame football coach, said these and many other inspiring words during his 36-year tenure at the helm of the Dutch football team. A moving bronze statue of the coach was recently added to the stadium in Pella, Iowa, which already bears his and his wife’s names. Dedicated on September 17, the statue is accompanied by a bronze plaque on a stand manufactured by Pella Engraving. 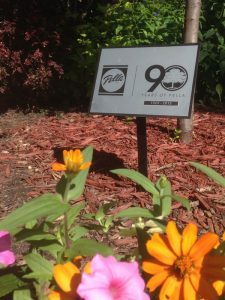 The black-painted aluminum plaque stand was manufactured and installed by Pella Engraving. 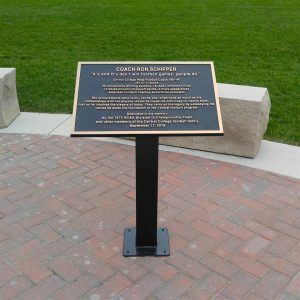 The bronze plaque lists the many accomplishments of Coach Schipper, among them 36 consecutive winning seasons and 18 Iowa Conference titles. The statue depicts him in a moment of mentorship with a player, which he is known to have valued more than any of his 287 wins. The stand for the plaque, which PEC installed on site, is black-painted aluminum. Its durability and subtle yet solid presence is the perfect option for displaying the plaque honoring this legend. A plaque destined for exterior display often needs a durable, attractive stand on which to be installed. Pella Engraving offers garden stakes, memorial stakes, and other types of plaque display stakes for this purpose. These display stakes are available to both customers placing individual plaque orders and dealers interested in placing bulk orders to offer to their own customers. We offer two standard sizes and styles, but we are always willing to discuss manufacturing a custom plaque stake or heavy-duty stake that will better meet dealer and customer needs. Two-piece, heavy-duty stake. A 4-, 6-, or 8-foot solid, black-painted aluminum pole with a separate backer head-mount. Shipped in two parts. If a plaque is part of the order, it ships attached to head-mount. Plaque stake. A 22-inch tall, black-painted aluminum stake with a backer plate on which your plaque can be mounted. Maximum plaque size recommended for the plaque stake is 8×10 inches. Ships assembled. Watch our plaque stake video to see these options. Bulk orders of both plaque display stakes options are available. To qualify for a bulk-order discount, just order 10 or more stakes of the same kind. No plaque purchase is necessary. We will consider discounts on bulk orders in custom sizes as well—just contact us to start the process! 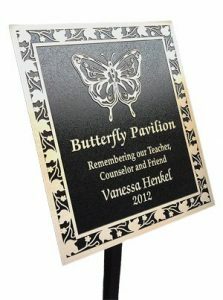 If you’re creating a memorial plaque destined for exterior display, Pella Engraving Company offers stake options to meet your presentation needs. Life is full of people, places, and events that deserve to be remembered. One way to preserve those memories is with a long-lasting, personalized memorial plaque. With a memorial plaque, you can honor a company founder, commemorate a historical event, or pay tribute to a friend or family member. Magnesium – An economical option perfect for detailed artwork, but exclusively for indoor use. Zinc – Great for detailed artwork and indoor or outdoor durability; an excellent lower-cost alternative to bronze. Bronze – A classic option that conveys a sense of importance. Brass – An elegant, lower-cost alternative to bronze. An image can be etched into the brass and then filled with color, or the plaque can be etched with a raised image then given an antique finish. Metalphoto – A nice, less expensive material for a lasting plaque. Whether it is all text, or includes a photo, Metalphoto is for you. These plaques can be used indoors or outdoors and resist weathering, fading, and abrasion from UV rays, heat, salt spray, and cleaning products. Copper – Offers a recognizable warm, ruddy color and classic feel; suitable for outdoor or indoor use.